Formerly Shinko and now known as Sinfonia, the Japanese company is one of the leading suppliers of dye-sublimation printers and consumables in the world. Sinfonia’s suite of printers offers the studio and event photographer quality images, superior performance and cost-effective printing solutions. First utilized in retail kiosks by the Eastman Kodak Company, Sinfonia printers can now be found in retail photo applications, portrait studios and photo booths all over the U.S. Imaging Spectrum has been selling and supporting Sinfonia printers since the early days with Kodak. We now offer the full line of Sinfonia solutions and a deep inventory of supplies for every Shinko and Sinfonia photo printer. 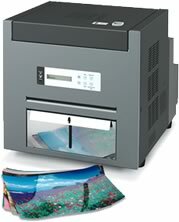 Whether you are looking for Shinko media supplies or for the latest Sinfonia photo printer solution you have come to the right place. Order online or give us a call and speak with one of our customer service reps today. The Sinfonia Color Stream CS2 (model no. CHC-S6145) is the world's smallest and lightest photo printer, while still maintaining excellent print quality, durability, and fast print speed! 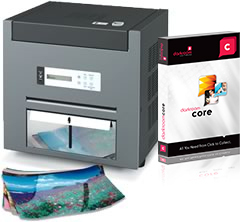 The Sinfonia S1245 professional photo printer makes producing borderless 8"
The Sinfonia S2145 professional photo printer makes producing borderless 4x6, 5x7, and 6x9 prints fast, affordable, and easy.